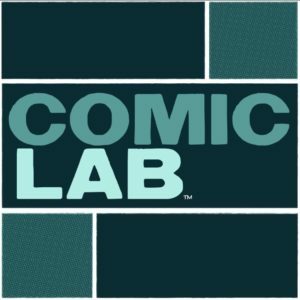 Dave Kellett and Brad Guigar are talking comics! In this episode, the guys talk about the cartoonist from history that they would have most appreciated a chance to be tutored by. Then, Dave delivers an update on how Backerkit has been working out for him. After that, Dave points out that Brad keeps saying “Time is a continuum,” but… what does that actually MEAN? Next, Brad references a recent social-media post by Joe Rogan that glorifies success — at all costs. 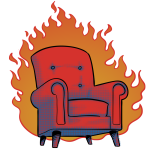 Brad and Dave talk about how dangerous — and counterproductive — that kind of attitude is. And finally, Dave has some financial advice for cartoonists” Plan for a recession NOW. BUT FIRST… Ikea is offering inspirational e-mails, and Dave wants to know what’s in those messages. 12:25 — Which cartoonist would you love to have had as a tutor? 32:40 — What does “Time is a continuum” mean? In a Surviving Creativity podcast a couple years ago, Scott Kurtz, Cory Casoni and I discussed how creator reaction to the Patreon service-fee announcement spiraled out of control — and had some pretty nasty consequences. During that conversation, we identified an urgent need for creators to do better when it comes to crisis management. Very few of us are truly a DIY operation — no matter what we may think. 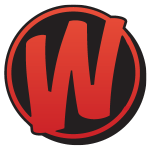 We rely on a vast array of third-party partners — WordPress, Kickstarter, Patreon, Gumroad, Paypal, Stripe, Amazon, ComiXology, and so on. All of these third-party entities share one, important factor in common — they’re all profit-motivated businesses. And, as such, they can (and will) make decisions that they feel are necessary to provide a profit for themselves. That’s how the game is played. That means that, sometimes, those decisions will be detrimental to the creator using that service. And when that happens, it’s very easy to fall into a panic and run to social media to unleash our fury. The problem is, this can have significant consequences on our own businesses in the process. 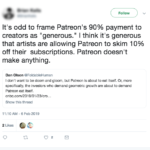 For example, when creators flew to their Twitter accounts to shout “the sky is falling” rhetoric over Patreon’s service-fee decision, they caused serious damage to the site’s reputation among their own backers. Once the problem was — inevitably — addressed, these creators now face the daunting task of repairing that damage so they can coax back their departed patrons. Thus the imperative to do better. It’s easy to get swept up in a panic response. You open your social-media app one morning, and you see trending topics, notables in your community spouting angry commentary, and hashtags aplenty. As a result, you have exactly the kind of emotional reaction that social-media thrives on. Before you know it, you’ve made a definitive stance on a topic that you may not have taken the time to fully understand both sides of. And that’s your first clue. The best place to watch a stampede is from a distance. When you see a visceral, widespread reaction to anything, your first instinct should be to gain perspective. Take a breath. Realize that this problem — if it is, indeed a problem — will certainly have a solution. And start accessing reliable sources of information to find that solution. 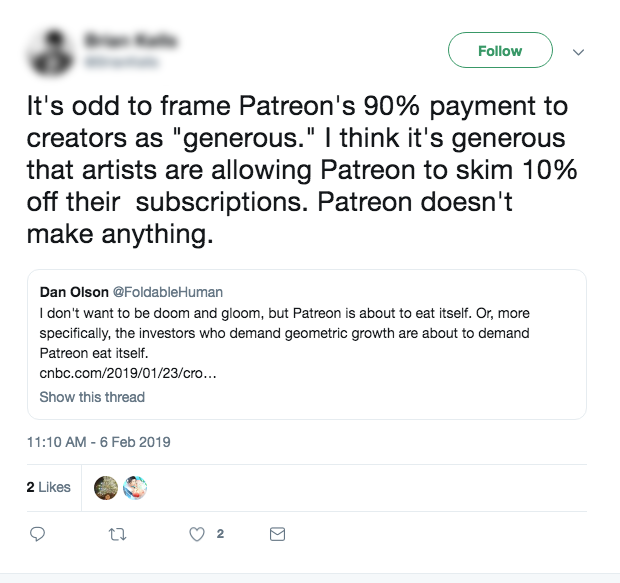 It’s a phrase I used repeatedly during the Patreon service-fee crisis: Model pragmatism. A pragmatic approach is simple. Define the problem. Understand it fully. Advance towards a solution. It identifies facts and takes the time for nuance. A pragmatic approach does not involve emotional arguments, idealistic views or romantic outlooks. Why is this so important? Because your social-media followers are taking their cues from you. If you react with panic, they will follow suit. If you model calm, your backers will respond to that. A pragmatic response to a crisis simply states what the problem is, notes that it’s an ongoing situation, and creates avenues for open, honest discussion. Mind you, you are not the only voice that your social-media followers will be listening to. And much of what they may be hearing during this crisis will be from some of your peers who have given in to a panic response. That’s why timing is of the essence. You need to get your response out as early as possible. Frame the situation calmly — but accurately. Share as many facts as you can. Caution against some of the shoddy information that is doubtlessly circulating. And offer sincere assurances that WE (your backers/followers and you) will weather this storm together. And then cultivate your lines of communication. Let’s face it. Webcartoonists thrive on communication. It how we operate. 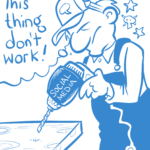 We rely on a steady flow of social-media communication for reader outreach. We make ourselves available through countless forms of contact. We’re primed for this sort of thing. So don’t drop the ball. Remind readers of the myriad of ways they have to contact you. Make yourself available for discussion. Set up special forums in which readers can voice concerns. And, in those conversations offer the facts that you have verified and emphasize any ongoing progress in the situation. Don’t lie — don’t even stretch the truth. But simply share calm, reasonable words. At some point, the crisis will come to an end. When that happens, offer your backers closure. It may not be the end that you had hoped for. Or maybe it’s a far better conclusion than you had anticipated. Either way, make a marked effort to help your followers close the chapter. And move on to whatever is next. Your ability to handle yourself thoughtfully and calmly in a difficult situation is going to be definitive in your ability to sustain the countless ups and downs involved in piloting a career as a creative professional. Don’t let a momentary panic derail the creator-reader relationships you’ve spend such a long time fostering. And, overall, be a leader in the next crisis – not a follower. In case you were wondering, Patreon made… Patreon. You know… that crowdfunding platform that over 50,000 creators are using to generate over a billion dollars from 3 million active patrons. They made that. Instead of hyperbole, let’s talk about the matter in a level-headed manner. 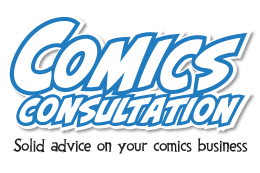 Dave Kellett and Brad Guigar are talking comics! In this episode, they point out that the Eisner Awards have changed their submission guidelines — and that’s great news for short-form webcartoonists! THEN they discuss a tweet by Nate Powell that has everyone talking. 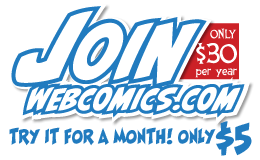 This Eisner-winning cartoonist claims his income breaks down to about $455 a month! NEXT, it’s all about joke theft — what do do when you’re accused of it, and what to do when it happens to you! THEN, Dave and Brad do a deep dive on exclamation points. How many it enough? How many is too many?! And what about the interrobang? FINALLY, the guys talk about embedding ads in your comic to promote a Kickstarter or Patreon campaign. But first… Dave’s son explains how Superman shaves, and it has us in stitches! 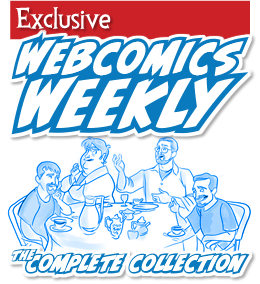 Webcomics pros Dave Kellett and Brad Guigar are talking comics! In this episode, they discuss what you should do when you realize you’ve lost longtime readers. Then, where should you work, when you work from home? What kind of day job should you have? And finally… how do some cartoonists produce those amazing sketchbooks? 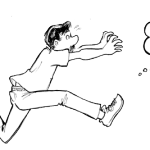 But first… Dave’s going to Alaska Robotics’ Comics Camp! 06:10 — Why do longtime readers fall away from your comic, and how can you address it? 14:21 — Where should you work, when you work from home? 28:00 — What are some things folks need to know before going into comics full time? 40:54 — What kind of day job is best — menial or creative? 55:43 — How do some artists release those massive sketchbooks? Writing humor is something many of us grapple with. In the past, I’ve discussed a method that I advocate called Fermentation. And in many critiques and discussions, I’ve found myself advising writers to push or push further or push to the Funny. And every time I write those words, it occurs to me that the phrase is somewhat ambiguous and my advice may be missing the mark. So I’m going to try to refine the Fermentation method, and I’d love for those of you who are working in humor to try it out and let me know how it worked for you. (More on that later). Once you’ve written your joke — refined the set-up and fine-tuned the punchline — I want you to leave it for at least 24 hours. I think this is crucial. It allows your subconscious mind to come into play and it brings you in fresh on the next day. Now, look at what you’ve written and add another panel. Your job now is to use your punchline as a set-up to another punchline. Take the concept one step further. If an action has happened, explore the after-effects. If a surprise was introduced, top it with a bigger one. If the punchline was word-play, warp the words another step. Finally, reduce the comic to its original panel count. Let’s say you do, indeed, produce a four-panel strip. Either lose the fourth panel and go straight from Panel There to Panel Five (making any necessary wording adjustments) or incorporate any crucial parts of the fourth panel into the third panel. And “crucial” is the operative word here. The point is not to write longer, it’s to write better. The optimum outcome should be to arrive at a sequence in which the word-count is very similar to the original. Before I go any further, I want to thank member Oskar van Velden of Mojo who graciously agreed to allow me to use his most recent strip as an example. I noticed Oskar’s update on Google Plus, and it struck me that this was a perfect subject for this conversation because, although the punchline was good, I think it could have been taken to a higher level. Click on any of the images for an enlarged view. This was Oskar’s most recent comic. But when I saw it, I couldn’t help but think about how the really funny stuff happened in the unseen next panel. So, let’s allow our minds to wander for one more panel. The idea of trying to stop nicotine cravings by slabbing slices of turkey meat on you skin has a really nice silliness to it. And the turkey slices look enough like the nicotine patches to make the concept cross over effectively. I’m not even necessarily saying that this particular fifth panel is the best of all possible fifth panels. And you could definitely refine it. For example, I might have added a skinny panel between Panel Two and Panel Three in which the penguin and the cat walk away from the man, having removed their patches. It might prevent a reader from thinking that the nicotine patches are being removed in the final panel. I feel confident in saying that it’s an improvement, but I’ll bet there are dozens of “fifth panels” that you could dream up that take this very good set-up and push the concept to a much funnier place. (1) Go through your archive and improve a couple strips using the Fifth Panel method. Post Before and After strips here for discussion. (2) Use this method as your writing future strips, and post the results. The “Before” could be a written script and the “After” can be the finished comic. If you’re interested in subscribing to Webcomics.com, you can get access to four posts a week containing news, tutorials, information and advice that applies directly to your career as a cartoonist — plus the private forum and exclusive member benefits. A $30 membership gets you access for 12 consecutive months. But if you’d like to try it out for a month to see what you think, you can get a no-strings-attached one-month trial membership for five bucks. Still on the fence? Scroll down. 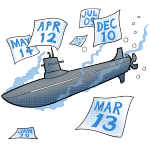 You won’t be able to read the full articles yet, but you can see the diverse topics and useful information that make this site a daily stop for so many working cartoonists.